Ryan Exon Named First Lion of the Round for 2018! 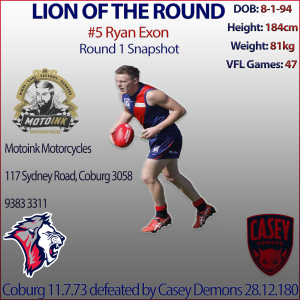 Ryan Exon has been named the MotoInk Motorcycles Lion of the Round this week, following a solid performance in defence from the 24-year old during Sunday’s season opener against Casey. Now in his second season at Coburg and with 47 VFL games under his belt, Exon played his role in defence well as he led the young back line. “I played mostly as a high half back,” he said. A smaller Coburg back-line had a mountain of work to deal with during the match, as Casey recorded 68 inside-50s for the afternoon. “We were a little undersized but kept having a crack all day; there is a lot of work we need to do in order to get better,” Exon continued. Assistant coach Andrew Sturgess was full of praise for Exon’s performance on a tough day for the young Coburg team. “He (Exon) was great all day,” said Sturgess. As one of the leaders of a young backline, Exon was also pleased to see nine debutants on the ground on Sunday. “To get experience into those blokes is a real positive,” he said. Despite Coburg being his third VFL club, Exon most enjoyed his successful season last year where he played 17 games and finished runner up in the club best and fairest. The players will tonight review the match from the weekend, before shifting focus to this Saturday’s clash against the Bulldogs. “We’ll move on and get ready to attack the game against Footscray with an aim to get a much more positive result,” Exon said. Barring injury, Exon will play his 50th VFL game in round four when Coburg play host to North Melbourne at Piranha Park. This article is sponsored by MotoInk Motorcycles – 117 Sydney Rd, Coburg. For more information be sure to check out their Facebook page.